Cadette Girl Scout Troop 11482 in Steamboat Springs and some Daisies and Brownies volunteered on Sunday, June 9, to plant trees as part of ReTree Steamboat. The trees were planted at Steamboat Ski Area where large sections of trees were devastated by the pine beetle epidemic. The efforts made by these volunteers will benefit generations in the future! The beautiful grounds of the Penrose House Garden Pavilion are always a treat to visit annually when we hold our Highest Awards Celebration in Colorado Springs. On Tuesday evening, May 28th, we enjoyed a beautiful evening as we honored seven of this year’s Colorado Gold Award recipients as well as dozens of Silver and Bronze Award recipients. It was a great evening to hear how these recipients have gained leadership through earning one of Girl Scouts’ Highest Awards! Learn more about our 2013 Highest Awards season on the blog we wrote after the Highlands Ranch event in April. A video capturing the essence of the Colorado Springs event, especially personal remarks from each of the Gold Awardees honored, can be viewed below. Information compiled and posted by Amanda Kalina, Director of Public Relations for Girl Scouts of Colorado, with assistance, including the videography and photography work, from Rachelle Trujillo, Chief Marketing Officer. Our May 30, 2013, Cocktails & Cookie Creations event at Catamount Ranch & Club in Steamboat Springs was a huge success! More than 80 people attended this inaugural event and helped raise more than $8,500, which will be used to provide Girl Scout programming in the area and to send Routt County Girl Scouts to Keystone Science camp. Lead sponsors for the event included Craig-Scheckman Family Foundation and Steamboat Motors. Beverage sponsors were South Side Liquors and Breckenridge Brewery. In addition to fabulous creations made with Girl Scout Cookies, the evening included games, a silent auction and live entertainment by Todd Musselman. We are already looking forward to the 2nd annual event in Spring 2014. We are not anticipating disruption to our overnight camp sessions at this time. The safety of our girls is always our top priority. GSCO has strong emergency action and evacuation plans in place. We are in frequent contact with all local authorities so that we are prepared to deal with any fire conditions. At this time, none of our camp properties are in danger from wild fires burning in the state. 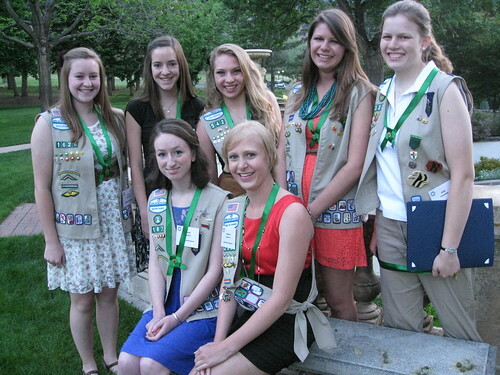 As updates are available, they will be posted to the GSCO Facebook page and the Girl Scouts of Colorado website. If any family is uncomfortable with sending their girl to a program, or participating in any programs due to their location in proximity to fires or evacuation center, we will grant their refund requests. Is your Girl Scout registered for camp yet? We still have spaces in the following sessions! Register online now. Remember, registration closes 4 weeks before each camp starts! To learn more about our summer camp programs, check out our Summer Camp Catalog! NEW: check out this amazing new search tool to help you find open camps! Girls from Troop 2569 in Westminster earned their Bronze Award by making toys for animals in local adoption shelters. They also donated extra materials gathered for their projects. They made tug of war toys for dogs at the Boulder Humane Society which we delivered to our local PetSmart. The made happy socks for cats in a local adoption shelter called Almost Home for Cats. Lastly, they made toys for bunnies at the Colorado House Rabbit Society, which some of the girls learned about through a Take Action project last year for one of their Journeys. Our troop of 13 Juniors made 162 fluffy cat beds and 88 cat toys to donate to the Denver Dumb Friends League as our Take Action project. The troop worked together to identify a need in our community, contacted the necessary people, found out how we could help and got to work! We very much enjoyed our field trip to the Dumb Friends League to drop off the items – staff there told us that our donation was the largest they had ever received at one time! We were happy to learn how to work together as a team to meet a need in our community. The four Cadettes of Girl Scout Troop 53124 spent their time gathering and making items for four local hospitals. They made and delivered 100 fleece blankets, 78 heart shaped pillows, and approximately 150 activity kits that they got from the my kid needs that website. They collected donations of diapers, wipes, games, puzzles, toys, and other baby items to give to these hospitals. It took 22 months and 400 hours of time to complete their Silver Project valued at $3,537. One volunteer told them they had delivered 202 miles of smiles. All four girls felt a great sense of satisfaction and joy when they delivered the items to the hospitals. They were surprised by how a seemingly small act of kindness made so many people so happy. Way to go, girls!